Telemedicine has the potential to revolutionize how healthcare is delivered across the entire landscape. There are advantages for patients and providers alike in every specialty from family practice to dermatology and elder care. When it comes to the treatment of addiction, telemedicine is ideally suited to support providers and patients working to make significant life-saving changes. 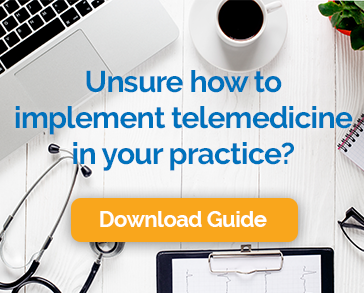 The practice of telemedicine is not an independent medical specialty. There are several types of technologies that can be considered telemedicine including store-and-forward applications and remote patient monitoring. One of the most popular is the practice of remote encounters that can offer an alternative to in-office visits. The patient and provider are connected using specialized, secure, high-definition video connections on computers or mobile devices. Consumer grade applications like Skype and Facetime are not adequately secure for clinical encounters, so purpose-built technology that is designed to meet HIPAA’s high standards for patient confidentiality are used. Addiction treatment can be a long process that requires many and varying types of encounters. Treatment typically involves three stages; detox, rehabilitation therapy, and extended care. Sadly, the logistical barriers, coupled with shame and privacy concerns can keep some patients from getting the care that they need. Telemedicine can help in three key ways. Patients are often very concerned about others finding out they are in treatment for addiction. There can be very real consequences if co-workers, classmates, family members or others in the community discover the patient’s challenge. Even if a provider has excellent confidentiality procedures, each in-person encounter represents an opportunity for an unwanted chance encounter. Telemedicine visits, on the other hand, can be conducted from the privacy of the patient’s own home. Patients do not need to interact with office staff, other waiting patients, or anyone other than the provider or members of a group therapy session. Recovering from addiction is a long, tough journey. Some people are best served with in-patient care, devoting 100% of their effort to rehabilitation. But for many, recovery can be achieved without disrupting work or school. Some patients are more willing to engage in treatment if they can do it without putting other aspects of their life on hold. Telemedicine makes this possible by allowing patients to have as many encounters as they need on a flexible schedule that works with their other obligations and priorities. Telemedicine increases access to addiction treatment resources in a couple of ways. First, it reduces the costs for patients by eliminating the expenses (and time) of public transportation, or commuter costs such as gas and parking. Patients don’t have to worry about childcare or take time off of work, both of which can contribute significantly to the cost of getting care. Telemedicine also makes it possible for the limited number of qualified addiction care providers to manage more cases and help more patients without sacrificing the quality of care. Does Telemedicine Work for Addiction Treatment? Of course, the advantages of privacy, flexibility, and access don’t count for much if outcomes aren’t on par with in-person treatment. Fortunately, they are. Several studies specific to mental health treatment, including the VA Telehealth Efficacy Study that involved almost 100,000 patients, have found that treatment results are as good, or even better than the in-person standard of care. The VA study covered disorders that ranged from affective disorders, anxiety disorders, post-traumatic stress disorder, and psychotic disorders, to substance abuse disorders. For providers looking to add telemedicine to their options for addiction treatment, there are some issues to consider. Many state laws and a growing number of insurance provider policies provide reimbursement for virtual visits on par with in-office encounters. This is a sign that they recognize the role telemedicine has to play in the future of healthcare. Each state regulatory agency has different rules regarding which types of providers can perform video visits, whether an in-person encounter must proceed a remote visit, and which medications, if any, can be prescribed during an online encounter. There are several solutions on the market, is it is important to leverage one that will be easy for you and your patients to use, integrate with your existing EHR or practice management system, and meet privacy and security requirements. The gold-standard solutions recognize that there is currently no uniform approach to reimbursement, so they offer pre-visit payment verification and a reimbursement guarantee. Providers should take care to educate patients about the value, and limits of telemedicine in the treatment of addiction. It is not appropriate for every situation, but when it is, patients will need reassurance about privacy, efficacy, and ease-of-use. Telemedicine should improve access and convenience, not scare patients away from getting help. Receiving treatment for addiction can impact the life of a patient in profound and lasting ways. Any approach that removes barriers to receiving this critical type of care can make a difference for individuals, families, and communities. Telemedicine is poised to do exactly that.